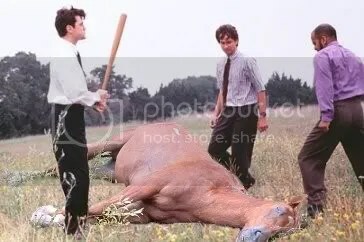 dead horses | How Do I Baseball? Sometimes, the enemy of good is better, and I sheepishly admit that I fall victim to this thinking quite frequently. I can’t just leave things alone; I must pick, prod, and dig a little deeper, until my curiosity is satisfied, or I have made the thing under my scrutiny completely unrecognizable, unworthy of salvaging. To put it another way, I am the world’s worst Jenga player. I am at it again. In between now and the previous Clippard love fest, the Nats have compiled a 19-7 record, and find themselves not only atop the NL East standings, but all of MLB, with a tidy 72 wins, 3 more than the vaunted 2010 club amassed the entire season. Clippard has saved 9 of those 19 victories, bringing his save total to 24, good for a tie for 6th in the NL, and for 10th in the MLB. While impressive, let’s pick a little more at this oh so itchy sabermetric scab. Much like my previous Clippard foray, let’s use some fancy pants statistics to see how impressive the season Clippard’s having really is. However, this time, let’s have Fangraphs provide us our numbers fix, focusing on some of their stats that are formulated to parse out a pitcher’s true value, and performance, all while removing factors that are out of the control of said hurler- things like park factors, the defense behind them, that sort of thing. I have included some more traditional statistics as well, just to keep things somewhat grounded in baseball statistics terra firma. For this round of mental gymnastics, I will again set the bar using Tyler’s stats thus far, and see who, if anyone, is having as dominant a season as their team’s fireman. So howzit look, about 2/3rds of the way into the 2012 season? Again, we find that Clip is having a lights out season as closer, and is in very rarefied air in terms of performance. To only be bested by Craig Kimbrel and Aroldis Chapman in some very critical stats that make or break a pitcher’s season, is an outstanding season. If we… OK, *I*, want to nitpick further, the disparities between Kimbrel’s and Chapman’s FIP, WPA, and SIERA, compared to Clip’s are probably best explained by Clippard’s propensity to not only walk more batters than the other two, but also by his fly ball percentage, and lower K/9. In essence, more fly balls mean more potential for hits, which means more runners; add that to more walks leading to more runners, and fewer K’s to neutralize those scoring opportunities gives us Clippard’s inflated in comparison peripherals. This, however, is splitting hairs – in the end, only two closers are bettering Clip for all intents and purposes, and Nationals fans should be happy with this notion, and leave it that.